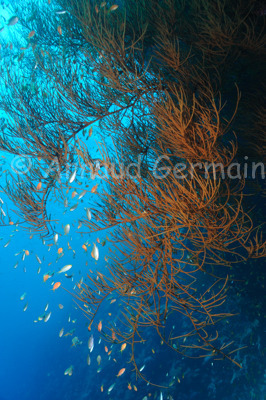 arnaud germain wildlife photography: Black Coral on Elphinstone Reef Drop Off. Black Coral on Elphinstone Reef Drop Off. Only on big drop-offs can you find huge branches of black coral such as these in the Red Sea. This one was photographed on the East drop-off of Elphinstone Reef, during a drift dive. It is host to a myriad of creatures. In this case, you can see the anthias and green damselfish around the branch. Nikon D700, Nikon 28-105 mm macro at 28mm, F8, 1/60th, ISO 400, Ikelite Housing and Ikelite DS160 strobe set on Manual x1/8. Elphinstone Reef, East Drop Off, about 30 metres down, Marsa Alam, Egypt.